To reiterate, every week during the season I'll be posting a summary of the Saints' game, complete with key stats and a "Good, Bad, Ugly" performance review. If you have ideas or feedback, please feel free to submit those to me via blog comment, Twitter, Facebook, email, text, message in a bottle or whatever floats your proverbial boat. Also, at four-week intervals, we'll see how the Saints rank league-wide in some important statistical categories. * as always, numbers in brackets [x] represent game totals, while numbers in parentheses (y) represent season totals. * Will the Saints' offense finally get the recognition for greatness it's justly garnered this season? Buried beneath the mounds of Packers' coverage and the sycophantish, fawning praise for Tim Tebow in the national media, this Saints' offense is quite probably the best offensive unit to grace an NFL field. And before this week, it's received nary a mention outside of the Saints' immediate sphere of media influence. The Saints stand just 682 yards shy of eclipsing the all-time yardage mark set by the '00 Rams (7075), and on Sunday the devastating potency and frightening diversity of the league's best offense was in its full, dominant glory. In case you weren't paying attention, this was taking place in Minnesota and not in Kansas City. 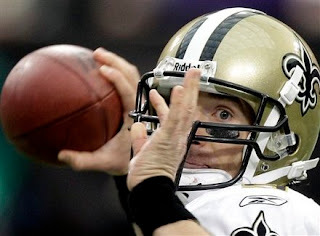 The Saints--after starting slowly and playing the majority of the 4th quarter with Drew Brees standing on the sidelines--racked up 573 yards, possessed the ball for nearly 39 minutes, passed for 412 yards, and churned out 161 yards on the ground. And let's just remember: this is the NFL, not the Big 12. For good measure, nine different players caught passes--four of them for 70 or more yards--while five different players scored a TD. Who says socialism can't work? * Amazingly, Drew Brees continues to get better and Sunday's game was among the best games any QB has ever played, as evidenced by his first-time-in-NFL-history stat line: 400+ yards, 80% completions, 5 TDs, 0 INTs. Another week, another record. Records keep piling up and opponents continue to flail away trying to prevent them. Brees is unquestionably playing the QB position better than anyone in the league right now, and maybe better than anyone's ever played it. Over the past five weeks, Brees has completed 72.5% of his passes; thrown 16 TDs and 0 INTs; and averaged 355 yards/game for a 125.1 rating. Enjoy it, folks. We are watching one of the best ever to play the position. That's increasingly more clear with each passing week. Are you listening Mickey Loomis? Rita Leblanc? Tom Benson? You best pay that man his money. * The Saints' running game continues to impress with its own layers of balance and continued, reliable efficiency. It's quietly become one of the league's best rushing attacks. Pierre Thomas perfectly epitomizes this sense of balance and diversity and against the Vikings, his full set of skills was on display. He gained 44 yards rushing (5.5 per), 41 yards receiving (20.5 per), and scored a TD. Moreover, Thomas flashed his trademark tenacity and second effort, repeatedly breaking tackles and accruing yards after contact. A great day for a player who represents so much of what the Saints stand for: selflessness, determination, intelligence, reliability, diversity of skill. Additionally, Chris Ivory again filled in admirably for Mark Ingram, gaining 74 punishing yards (4.1 per) while continuing to make his case for a full-time spot on the weekly active roster. Coach Payton has quite the conundrum on his hands when Ingram returns to health; and though I might be alone on this, I continue to believe that Payton will activate all 4 RBs for each postseason game. * With 232 all-purpose yards on Sunday, Darren Sproles, like many of his offensive brethren, is closing in on a record of his own. Sproles is 398 yards shy of the league record for all-purpose yards in one season (2690, Derrick Mason '00). If Sproles can uncork a long return in one of these last two games, he'll have a great shot at the record. Interestingly enough, Michael "Beer Man" Lewis currently sits in 2nd place for most all-purpose yards in a season (2647, '02). 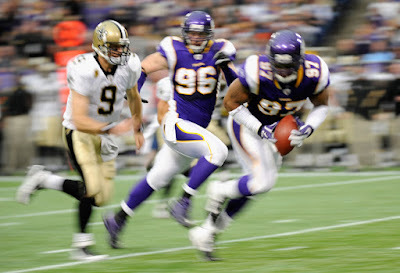 * Sunday's game was certainly the defense's best showing of the year, favorably responding to the challenge (threats?) posed by Gregg Williams last week. The defense held the Vikings to a meager 3.8 yards per play and just 207 yards overall. That's the 3rd fewest yards allowed during Gregg Williams' tenure in New Orleans, and the defense continues to improve late in the season. Once again, the defense played excellent on 3rd down, limiting the Vikings to just 29% of their 14 opportunities. More importantly, they deftly handled the adversity of being saddled with short fields early in the game, limiting the Vikings to two FGs and one TD after the offense turned the ball over twice and the special teams failed to recover a brilliant onsides kick. Finally, the defense generated pressure and notched 4 sacks. Yesterday's game seemed to be the defense's best effort this season from a pass-rush perspective, and if the Saints have designs on beating the Packers in Green Bay, it's incumbent upon them to generate a modicum of a pass rush from their defensive line. Sunday's effort was a step in the right direction. 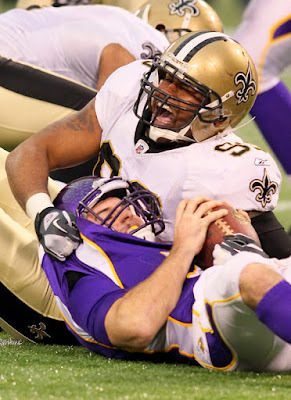 * The Saints started slowly and carelessly turned the ball over twice early in the game. Giving the hapless Vikings an early opportunity to believe they might win the game was a formula for a Vikings' victory, and the Saints provided them just that. As LT Jermon Bushrod noted in a postgame interview, without those early stops by the defense, this game "would've been a completely different beast." 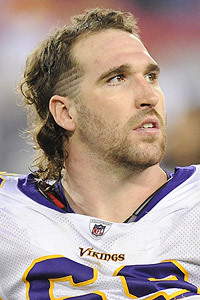 * Nothing much besides Jared Allen's mullet. * "This offense is just awesome." FOX analyst John Lynch, midway through the 3rd quarter.